When advertising your job online it’s important to consider how and where you will be posting your vacancies. The candidate your looking for could use a number of different job boards depending on their sector, location, job title and even general preference so finding the right job boards, means finding the right candidate. Best places online to advertise your job. 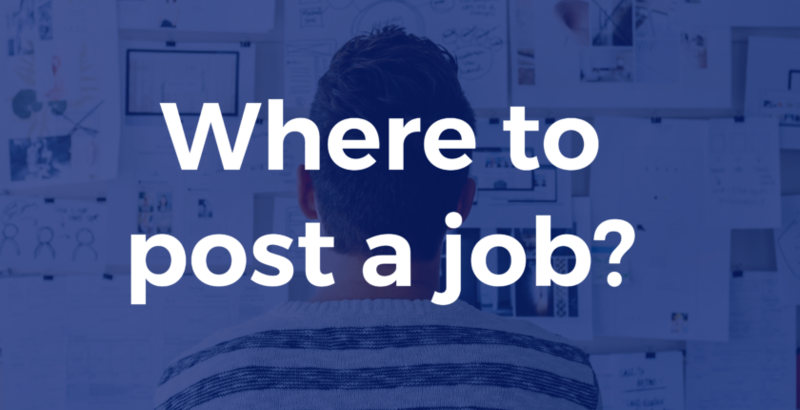 Given so many choices are available to us and most job boards claim that there the number one job site, how do we decide where to post our jobs? Firstly, you will need to decide if you will be using free or paid job boards and this will depend hugely on the type of roles your recruiting for and the amount of time you want to spend advertising. Most free job sites will rank your vacancy based on the time it was posted, more than the job relevance itself. As so many jobs get posted on their platform, this means you could end up on page 50 after a day or two. – It’s not just you that knows this site is free to post on. In our experience, you will end up spending more time going through applications that are not relevant to your job role to find suitable candidates. This is perfect for small companies who are recruiting and have ‘easy to fill roles’. What do we mean by this? There are many examples of easy to fill roles, let’s say the job was based in a desirable location or if you were offering higher salary than your local competitors. The job might not require many skills or have a large enough candidate pool to not have to spend any money on job advertising. Your applications will be much more relevant! Your job is based on relevancy and the candidates CV, meaning the candidate your looking for is more likely to find you. Less time going through unsuitable applications and more time hiring staff. Paid sites will invest money into advertising and email marketing to achieve better results for your job. There’s a good number of leading (all sector) job boards to choose from and finding the right ones can be costly. Candidates all have their own preferred job boards, so when advertising more difficult roles it’s best to advertise across a number of them. We’ve advertised thousands of roles over the years for employers across the UK and Europe and looking at the source of applications that were successful compared to unsuccessful, it’s clear paid job boards are more effective for finding talent. For more information, please see best paid job boards 2018. You can be advertised right in front of your desired candidates and still not receive an application to your vacancy. It’s important to consider what information you will be including in your job advert such as salary, benefits and day to day activities. A poorly drafted job advert could lose you money spent on advertising and your valuable time recruiting. Make sure your prepared before with our successful job advert guide and template. When deciding where to advertise your job online, you should consider whether to use free or paid job board sites. This will depend on the job seniority level, location, salary and many other factors that make a vacancy difficult or easy to fill. You should post to free sites if you have easy roles to fill and more time to shortlist through not suitable applications and use paid job boards for jobs that are easy to difficult to fill and save time with better-quality candidates. How we can help further! We work with over 2000+ employers, helping them distribute their jobs to over 100+ job boards and saving over 80% on their advertising fees. Have your job posted on multiple leading job board sites from just £95! Post a job across multiple leading job board sites from just £95.